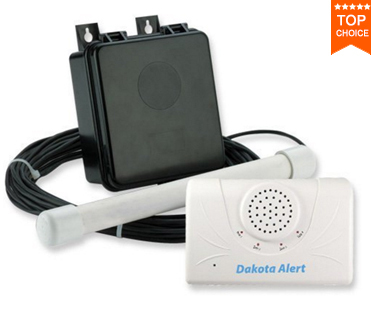 Summary: The Dakota Alert DCPA-2500 is the best driveway alarm system with the greatest sensitivity to false alarms. Even though the radio range is around 2000 miles (and not 2500 miles as advertised), the transmitter is still one of the strongest on the market. The Dakota Alert DCPA-2500 is used to detect vehicles only. Since this alarm system a uses state-of-the-art high sensitivity motion sensor, there’s no need to worry about false alarms. Another feature I really like about the 2500 model is that the probe is actually buried underground, so it’s impossible to see. The kit includes one transmitter, one receiver, a direct burial cable, a magnetic probe, mounting hardware and 4 CR123A batteries. The transmitter uses a magnetic probe and a direct burial cable to detect vehicles. When the transmitter detects a vehicle, it will send a signal to the receiver, which will sound one of the 4 tones. Note: the transmitter comes with several switches to change the frequency and zone settings. All these settings are preset at the factory; it is therefore recommended not to change these options, unless you experience false signals. If you’re looking for an alarm that will only detect cars, look no further then the Dakota Alert DCPA-2500. False alarms are virtually a thing of the past due to the state-of-the art motion sensor. The probe is one of the longest I’ve seen in a driveway alarm. The alarm also with all the bells and bells and whistles: waterproof, low battery alert, sensitivity adjustment and exit delay.